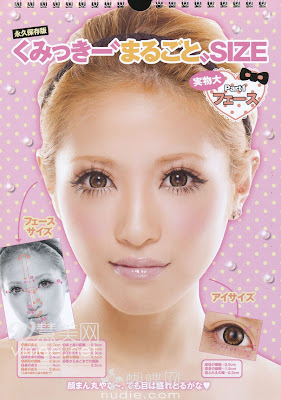 Her look is a great example of "Gyaru style" with kawaii fashion, very cheerful and happy just the way I like :) I am going to make Kumickey inspired tutorial soon *when I can make sometime* since I just got my pair of lower lashes in again! so please stay tuned for that! Ooo.. interesting calender but if Eki ever comes out with a calender.. I'll buy it! her eyes look cool = ] i'll try the dolly eyes sometime. she does have the perfect dolly look, i love her eyes! Wow, thanks for the scans! I adore her nails!!! So pretty! And... I really, really, really want a tiara, if only for prancing around at home in... LOL. Aww she's so sweet and cute! I really like this look although I think it would hard to pull off here in North America.